Do you ever go to your refrigerator and see small pieces of vegetables that by themselves would not make a meal? I’m talking about half an onion in a plastic sandwich bag, a peeled zucchini that has already been diced, a half cup of spinach sitting lonely in a bag that you didn’t use the night before. I always have great, lofty intentions to use these vegetables somehow, but alas, I’ll open up my refrigerator a few days later and find a brown mushy mess in my vegetable crisper. I just end up throwing them away and feeling guilty about it. I would think moms and dads with a number of mouths to feed face this issue every week. Here’s a recipe that will get your kids excited about vegetables and relieve you from your overwhelming guilt of throwing away that science project sprouting in your fridge. 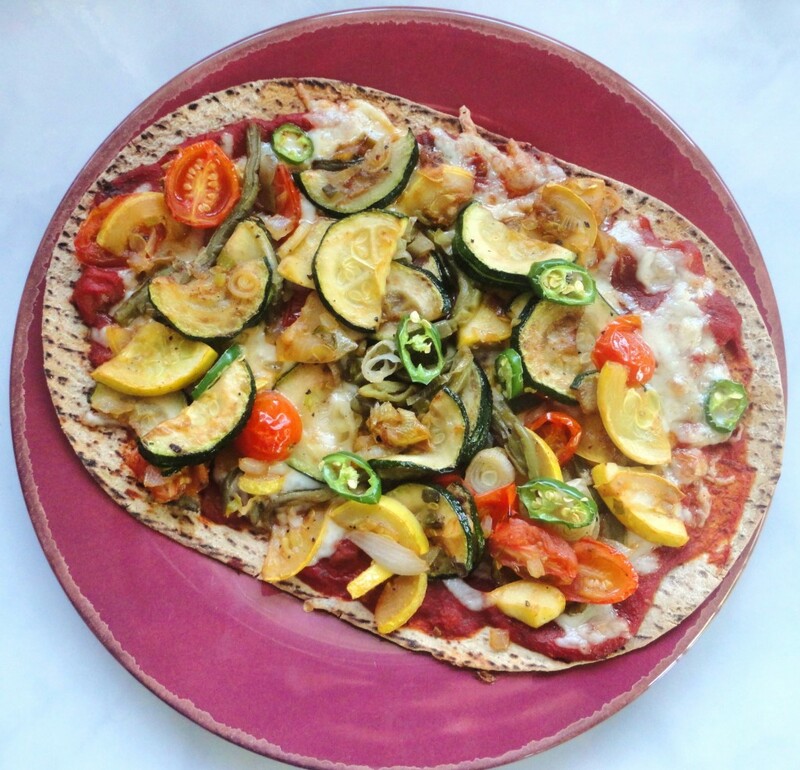 With individualized veggie pizzas, you’ll clean out your refrigerator and make room for the next trip to the Farmers Market. 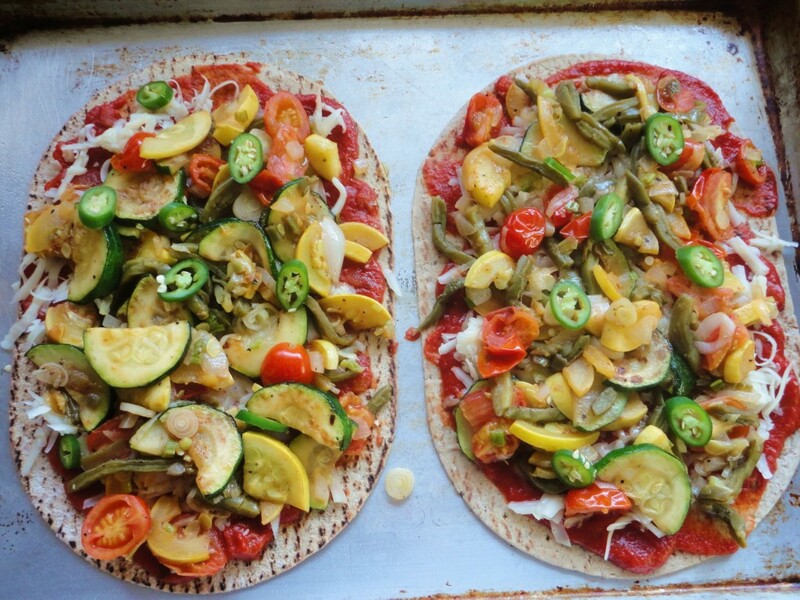 Just use the left over vegetables in your kitchen to top off your individual pizzas. Great way to clean out the fridge!You can buy any pre-made pizza dough, roll out your own, or we found these super yummy multi Grain flat breads that worked perfectly. The key ingredient to successfully have children eat their vegetables is to get them involved and excited about working with you in the kitchen. If they are old enough to handle a knife, let them dice and chop away with your very close supervision. If they’re too young to handle a knife, let them choose what vegetables they want on their individualized pizza. It’s important to remember that your kids need to make the pizza their own creation to be excited about eating it later. An older tween (about 10 to 12 years old) will want to mirror what the adults eat. 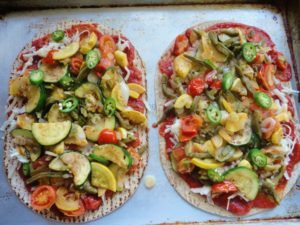 Show them on your pizza you are adding spinach, broccoli, zucchini and other “exotic” vegetables. Wanting to act like an adult, they will be more adventurous with their vegetable choices. A younger child may not and that’s okay. Little by little, they’ll be adding more and more vegetables, making the pizza look like a junk yard of veggies. Like the veggies, we just used the cheese we had on hand in our refrigerator. This included Monterey Jack and mozzarella cheeses. This is another time to be creative, a good parmesan, feta or Gruyère would also work nicely. Pre-heat oven at 375 degrees. In a medium frying pan, heat the oil over medium-high heat. Add zucchini, bell peppers, and onion. Add the spinach and season with salt and pepper. Cook until tender (about 3 minutes). Remove from heat. 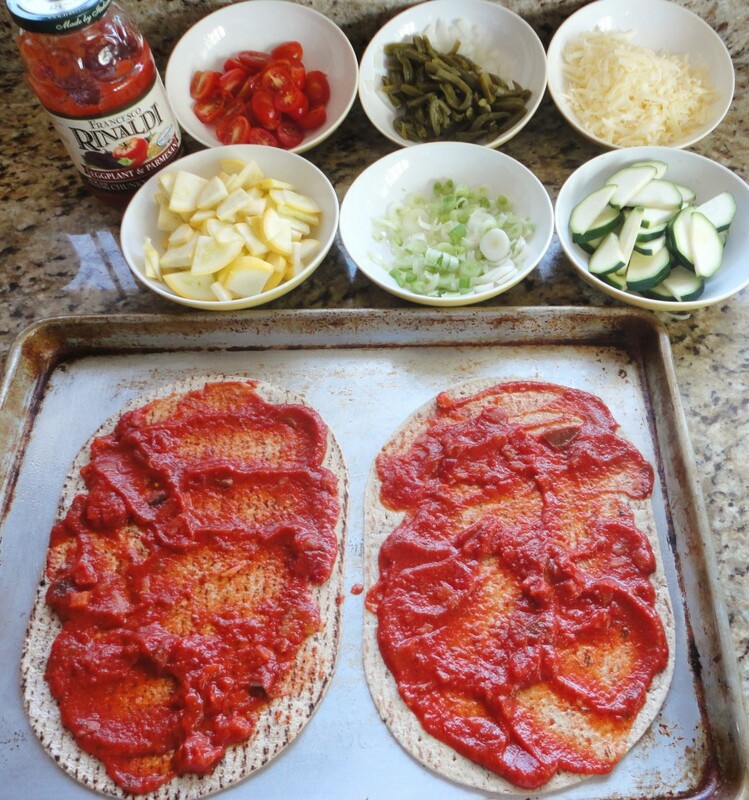 Place the pizza dough on a cookie sheet and spread the marinara sauce to cover completely up to the edge. 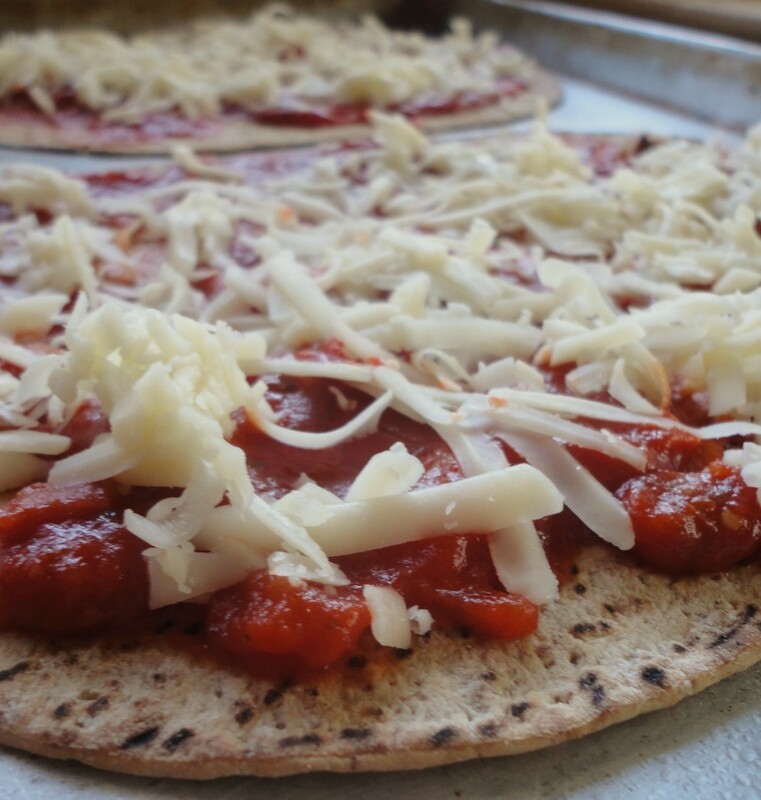 Sprinkle the mozzarella cheese to evenly cover the pizza dough. With a spatula, evenly spoon the vegetable mixture over the cheese. Place the cookie sheet into the middle rack of the oven and bake for 15 to 20 minutes.